Calls for civil disobedience and a general strike on 11 February are gaining momentum across Egypt in the wake of the massacre of football supporters in Port Said. The Egyptian Federation of Independent Trade Unions and the Egyptian Democratic Labour Congress, which between them claim a membership of around 2 million workers in affiliated unions have backed the strike call. 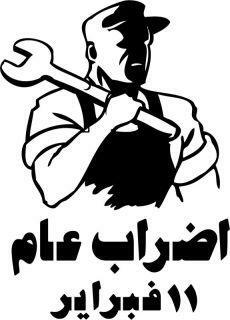 In addition statements promising action in solidarity on the day are being reported from regional union federations, including the 10th Ramadan City unions, the Textile Workers’ League in Kafr al-Dawwar, textile workers in the giant mills in Mahalla al-Kubra, and the Independent Union of Public Transport Authority workers in Cairo. The Cairo public transport authority workers recently occupied the Transport Authority’s headquarters demanding the resignation of management. There is intense agitation for the strike on university campuses across Egypt. By 4 February students in 34 public universities and 6 private universities had declared their intention to strike, and over the past day individual faculties have been making their own declarations of support. Announcements by school students planning to join the strike from several of the big Alexandria secondary schools were posted on Facebook on 7 February. 1. The return of the military to their barracks and the immediate restoration of civilian rule. 2. The resignation of the Ganzoury government which is a continuation of the old regime and a collaborator in all its crimes, especially its economic crimes in selling off the people’s assets in the form of its factories, and forcing the best of our workers into early retirement. 3. The formation of a national salvation government from the revolutionary forces. 4. Resignation of the General Prosecutor who is a creature of Mubarak, who has never taken any decision against Mubarak who appointed him along with his gang. Trade unionists in the US are mobilising to get signatures for this appeal over the use of US-made tear gas in suppressing protests in Egypt. Sign and circulate the international statement in solidarity with the Egyptian Revolution. February 8, 2012 in Campaign, Civil Service, Education, Egypt, Health, Manufacturing, Media, Postal, Rail, Sanitation and power, Strike reports, Transport, Union news.